Too many subscription programs get stuck. At launch, they grow quickly until reaching a plateau. Before long, cancellations begin to drag down growth. The key symptom is when you see a spike in cancellations within a month or two after adding a bunch of new members. This is when you know it’s time for a change. Harley-Davidson sells more motorcycles at premium prices than all of its competitors combined. Yes, the brand positioned as the most expensive in its category also has the highest sales volume, more than half of all motorcycle sales within its product categories. What does Harley-Davidson understand about selling motorcycles that Victory, Suzuki, Kawasaki, and Honda have never figured out? While the functional value of your subscription membership is an important element, the key drivers for breaking through plateaus and maximizing subscription and membership growth are all about emotion. How does your subscription solve problems for your members? How do your customers feel about the problems they face? What mistakes do your prospective members make that they don’t know they are making? While its competitors advertise their motorcycles’ features, horse power, and price, Harley-Davidson promotes the feeling of freedom you’ll experience when you ride a Harley. That feeling drives more sales than all the features and price data. Do your promotions focus on what you deliver to your members or on how they’ll feel after becoming your member? 2. Your race to maximize lifetime member value begins right after the sale. Too many subscription marketers are focused on what I call “a series of one-night stands.” Once they get a new member, they immediately move on to finding the next new member to recruit. They don’t take the time and make the necessary effort to onboard their newest members. Oh, they may have a series of upsells at the point of purchase. But once the clicks stop and the purchase is complete, most marketers lose interest in their newest member and move on to finding the next new member. I’ve developed a nine-point new member onboarding template to welcome new members, maintain their excitement for what they purchased, get them to use your product, and upsell them on other products and services. Does your current system maximize your new member engagement, retention, and member value? Do you have a structured upsell system optimized for what your newest member purchased and his or her interests? Or, does the new member get dropped into the general promotion calendar? The latter maximizes neither engagement nor lifetime member value; in other words, it’s not good for you or your member. Too many subscription companies think in terms of access. I’ll give you some stuff or access to something in exchange for money. This often works up to a point, but then wears out. There’s no stickiness and no relationship. As soon as your members find your stuff cheaper or without a subscription commitment, they are gone. 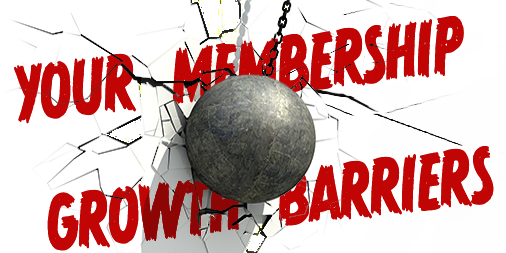 Explosive membership growth comes from creating a vibrant tribe of followers. Instead of trading stuff for dollars, identify your best customer prospects and invite them to join your movement, and when they show up, welcome them and introduce them to other members. Sometimes they “show up” by visiting an online forum or group. Are you engaging your new members, helping them meet new people, and making sure they feel included? Are established members able to articulate your values and apply them to solve their problems? A vibrant tribe becomes a membership growth and retention machine. Growth is organic because members of a vibrant tribe eagerly want to invite friends to join, as well. And once new members join and form relationships with other members, they want to keep their memberships to maintain the friendships they have developed. 4. Use the power of accountability to maximize subscription revenue. If there’s going to be sustained growth, someone must be responsible for that outcome. Too many subscription publishers have a director of marketing, a director of sales, and/or a director of fulfillment. Who is responsible for reducing refunds, increasing retention, and growing recurring subscription revenue? Does that individual have the resources, experience, and bandwidth to do the job? Two publishers have brought me on as a virtual retention chief. Similar to a copy chief that oversees your team of copywriters, a retention chief oversees your renewal, retention, and member engagement systems and breaks through plateaus for membership growth. 5. Track your vital signs of recurring revenue growth (and illness). The first thing the nurse does at every doctor’s visit is to check your blood pressure. Tracking your blood pressure over time is an important gauge of your health. Too few subscription publishers are monitoring the health of their membership program. Your monthly churn rate is the key performance indicator for the health of your membership. If it’s too high, you aren’t delivering what your member imagined when he or she joined. And, if your churn rate is too low, you aren’t selling well enough to recruit a steady flow of new members. Similar to blood pressure, a too low churn rate is just as deadly as a rate that is too high. Accept your invitation for faster and sustained membership growth. I have a comprehensive one-hour presentation on membership and subscription growth. If you’d like to see this presentation, email me at RS@RobertSkrob.com.